MYRTLE BEACH, SC (WMBF) With a forecast track now closer to the coast, the risk of storm surge has increased. The storm surge forecast has been increased and is now forecast to reach 3 to 6 feet. Causeway Drive will flood, and Pawleys Pier Village, Atlantic Avenue and Stamper Trail will all be impacted by standing saltwater. In the worst case scenario, water may surround the Town Hall and adjoining areas. Other low-lying areas near swamps and marshes may experience flooding as well. 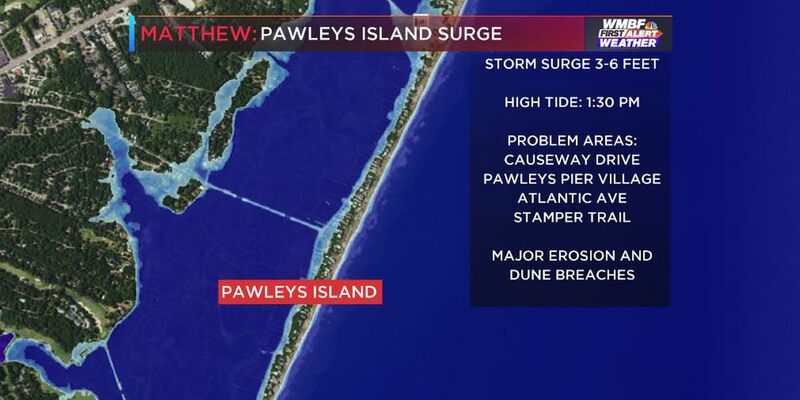 High tide in Pawleys Island is 1:00 AM and 1:30 PM on Saturday. These are the most likely times of coastal flooding and potential storm surge. Storm surge in Garden City may reach 3 to 5 feet. Typical flood-prone areas of Garden City will likely see standing and flowing saltwater especially around the times of high tide around 1:00 AM and 1:00 PM on Saturday. Flooding will likely impact Atlantic Avenue, Cypress Avenue, and areas along Azalea Avenue. Water may enter some buildings near the Garden City Pier. Large, breaking waves may result in dune run-up and dune breaches especially south of Garden City Pier. Major erosion is possible and significant damage to the dunes is likely. Surfside Beach will also likely see dune breaches especially south of the pier. Saltwater may pour onto some ocean front roads in the city. Thanks to slightly higher elevation, storm surge will not be as big of an issue in the city of Myrtle Beach. However, some problem areas are likely. Areas immediately adjacent to Withers Swash including Withers Swash Park may experience coastal flooding. Dune run-up and beach erosion is likely. Erosion could be major in the most vulnerable areas. Breaking waves may breach the dunes especially along areas from 70th Avenue North to 82nd Avenue North and salt water may pour into parking lots and ocean front streets. High tide in Myrtle Beach is around 1:00 AM and 1:30 PM on Saturday. The high tide on Saturday afternoon will likely produce the worst problems since that also corresponds with the time of peak on-shore winds. Flood-prone areas of Cherry Grove and North Myrtle Beach will likely see coastal flooding and standing or flowing salt water at times from late Friday night through Saturday night. The areas most likely impacted by storm surge will be Duffy Street and areas near Boulineau's, parts of Ocean Boulevard and Nixon Street. Areas between 42nd Avenue and 62nd Avenue and adjacent cross streets are likely to see coastal flooding as well. High tide on the North Major beach erosion and significant dune breaches are likely especially near the Cherry Grove Pier.